There are a ton of beauty subscription boxes out there nowadays, but I only subscribe to two: Birchbox and Sample Society. I do also subscribe to Julep because you can skip, and I frequently skip. I used to get more, but budget-wise it was getting to be a bit much, and if you get too many, you start to get repeat products. I narrowed it down by choosing the ones I think have the best value for the money and have the best customer service. Sample Society is the beauty box from Beautybar.com, which is backed by Amazon. It's an amazing box, full of high end samples. Sometimes you even get a full-size product, like the Butter London nail polish or the really pretty $40 hair accessories they have given out in previous months this year. It costs $15, and I am charged tax as well because I think Amazon has to charge tax if you live in a state where they have a physical presence. So mine comes to $16.43, well worth it. They also give you a coupon code for $15 off of a $50 purchase for the month if you include one of the sampled brands in your purchase. I took advantage of this a couple of months ago to finally purchase a much-coveted but expensive product. A lot of people don't know about Sample Society. I'm convinced that's because they don't have a very generous referral program. Many sites like this have referral programs where you can get points for referring friends, but Sample Society really doesn't. You can give friends a code to get 20% off their first order (mine is ANGIEK), but it doesn't work on Sample Society, only on full-size product orders. Sample Society's packaging and customer service is amazing. I have literally received a response within 15 minutes of an email when emailing them during business hours. And the products you get in the box are generous and high-end. There's never a delivery issue like you can get with some boxes, and I have never received broken items in my box. I do remember one month they couldn't fulfill orders right away and they delayed charging your card as well, but the delay was only a couple of days. 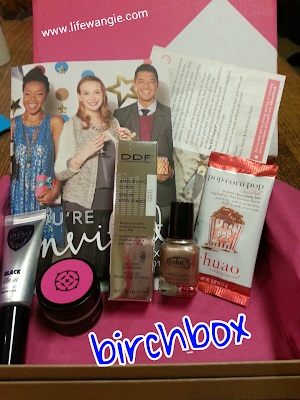 My other favorite beauty box is one of the originals, Birchbox. At $10, Birchbox is a great deal. Their products are medium- to high-end and I have found a lot of my favorite brands through Birchbox. They also sell a men's box for $20. Some people complain that you don't get very many full size products, but I don't know what they expect for $10, and the boxes in that price range that do contain full size items (like Ipsy) take forever to ship and are low-end items that you can buy at Target. I would rather try out high-end stuff before I buy, or just continue to hoard and use high-end samples. You also have an opportunity to do reviews on the site that translate into points you can use to buy full-sized products on their site, which basically translates into a $5 credit each month. Birchbox's site is more than a shopping site, which is another benefit. It provides instructions, sometimes including videos, on how to use the products. Their customer service is amazing, as well. The one downside to Birchbox is their packaging is a bit loose, and occasionally an item will break in the box. But any time this happens, the customer service is great, and they will replace the item if they can. One time, some perfume broke, and they didn't have any left, so they replaced my whole box! So I have kept that subscription going for years and I can't imagine ever cancelling it. Excludes existing customers of BeautyBar.com, AfterSchool.com, Soap.com or other Quidsi sites. Restrictions apply.